Pressure sensors are one of the most widely used components in control and monitoring systems around the world and across various industries. While its primary function, as the name suggests, is to sense pressure variations or measure pressure, pressure sensors are also extremely versatile, capable of measuring variables such as speed, altitude, fluid flow, water level etc. This versatility of pressure sensors which makes it a staple across automation industries is derived primarily from a single fact: its ability to act as a transducer. Transducers are devices which can convert one form of energy to another and pressure sensors are the best in this class. Their ability to convert mechanical or thermal energy into electrical signals at low cost with high reliability and efficiency makes them a crucial component of control systems. There are many types of pressure sensors employing many different type of technologies and principles. For example a manometer senses pressure and expresses them as a function of water/mercury level while a piezoelectric pressure sensor measures changes in pressure and expresses them as electrical signal. The former is preferred in systems which use high pressure such as hydraulic system while the latter is used to measure changes in pressure in tiny intervals such as in a gas turbine. Primarily though, the Pressure sensors are divided into three classes based on the type of measurement they provide as Positive pressure sensors, Negative pressure sensors and Differential pressure sensors. As the pressure sensors are used to calculate variation in pressure it stands to reason that they are measured in relation to a fixed pressure value. 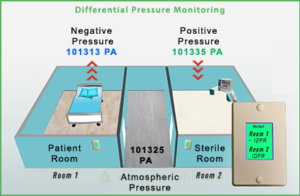 A positive pressure sensor senses any increase form this fixed value while a negative pressure sensor senses any drop from this optimal value. A differential pressure sensor meanwhile calculates the difference between two values essentially enabling the sensor to work within an interval. The functions and working principle of all three types of pressure sensors are discussed below. Before we move to discussing types of pressure sensors however, we must first discuss the different types of pressure. While the pressure itself does not vary in a system for the purpose of practice and calculation pressure is divide into 4 different types as absolute pressure, Gauge pressure, Differential pressure and sealed pressure. Absolute pressure is the actual pressure experienced by a body in space. As such it is calculated as the force experienced by the body per unit area. Absolute pressure is measured with respect to pressure experienced by the same body in vacuum. In practice, calculating absolute pressure of any element can be a tricky process as al bodies are under the influence of pressure exerted on them by the atmosphere. Gauge pressure is the pressure exerted by a body with atmospheric pressure taken as a reference point. Gauge pressure is much easier to calculate than absolute pressure and hence is the preferred choice in most practical application. However, gauge pressure varies based on a variety of factors which affect atmospheric pressure such as ambient temperature, humidity, altitude etc. and hence have to be constantly monitored and adjusted accordingly. Gauge pressure can be calculated by subtracting atmospheric pressure value from absolute pressure value. Differential pressure is the pressure difference that exists between two media. Calculating differential pressure is extremely useful in applications were pressure drop or pressure rise has to be calculated across space and are hence very popular. 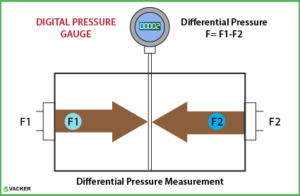 Calculating the differential pressure between two media is often as easy as calculating the absolute or gauge pressure of each individual medium and finding the difference between them. 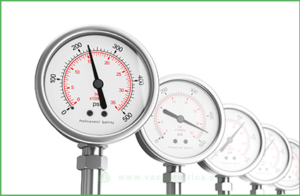 In fact even gauge pressure itself can be described as a type of differential pressure, calculating the difference between absolute pressure and atmospheric pressure. Sealed pressure is very similar to gauge pressure. However, when calculating sealed pressure a reference other than atmospheric pressure is taken. This is primarily used to calculate pressure within isolated systems and closed systems. A positive pressure sensor is a pressure sensor used to monitor increase in pressure. Essentially positive pressure sensor notifies any system that the pressure has exceeded the limits set for the particular system. These limits, in effect, acts as a reference pressure beyond which the sensor reacts. Positive pressure sensors are widely used in limiting systems. For example, consider an industrial boiler. Industrial boilers are used in many applications ranging from heating, to sanitation to power generation. It functions by heating water or any other fluid as per requirements within a giant vessel to produce steam or gaseous form of the fluid respectively. However boilers are inherently dangerous. As water is boiled within the boiler, it changes state and becomes steam. In the process, the water expands, now occupying a volume up to a thousand times the original water volume. In addition to this heating and state change rapidly increase the kinetic energy of water molecules meaning they exert tremendous force on the walls of the boilers. If this pressure exceeds a certain limit, the walls of the boiler can collapse, spraying scalding hot steam and causing huge damage to property and even life. A positive pressure sensor can help prevent this situation by monitoring the pressure and asking the boiler to be shut down and / or steam let off when the pressure rises above the safe levels prescribed by the boiler specification. It is important to note why a positive pressure sensor was preferred here. Firstly, any drop in pressure is both extremely unlikely and, more importantly, inconsequential as a lower pressure would do nothing to the boiler. Secondly, the maximum value of tolerable pressure is a fixed value determined by the boiler manufacturers and hence no variable pressure calculations are required to set limits. Finally, the working principle of the boiler is such that increase in pressure is the guaranteed and noteworthy outcome. A negative pressure sensor is a pressure sensor used to monitor drop in pressure. Essentially negative pressure sensors notifies any system that the pressure has dropped below the limits set for the particular system. These limits, in effect, acts as a reference pressure below which the sensor reacts. Negative pressure sensors are also mainly used in limiting systems. For example, consider an industrial freezer. Industrial or walk in freezers are used to store and preserve meat and other poultry items. However as these freezers have to maintain extremely low temperatures, often they end up converting the moisture inside the room to ice. This can reduce the humidity within the freezer drastically. As this dry air comes in contact with the stored goods, they absorb moisture from them reducing the weight and quality of the produce. Industrial freezers usually deal with this problem by using a humidifier or a ventilation system to introduce humid air from the atmosphere. However, this needs to be done at precisely the right time failing which the industrial freezer will unnecessarily consume large amount of power to cool the newly introduced air. Industrial freezers use negative pressure sensors to aid in this process. As water vapor from the air condenses the density of air inside the freezer reduces. This in turn reduces the pressure within the freezer. As the pressure drops below a fixed threshold, the pressure sensor informs the ventilation system or humidifier the room needs more humidity. When used along with a hygroscope which measure humidity, this can effectively lead to large savings which come in handy as industrial freezers consume a lot of power. It is important to note why a negative pressure sensor was preferred here. Firstly, any rise in pressure is both extremely unlikely and, more importantly, inconsequential as a higher pressure would have no impact on the freezer function. Secondly, the minimum value of tolerable pressure is a fixed value determined by the freezer manufacturers and hence no variable pressure calculations are required to set limits. Finally, the working principle of the freezer is such that drop in pressure is the only guaranteed and noteworthy outcome. A differential pressure sensor is used to monitor if the pressure difference between two different media exceed or fall below a certain threshold. Essentially, the differential pressure sensors ensure that the pressure difference between two media is limited to within a fixed interval. Differential pressure sensors also allow systems to react dynamically to change in conditions as opposed to the single function signals of the positive and negative pressure sensors. Unlike the positive and negative pressure sensors, the reference of the differential pressure sensor is not fixed but rather an interval is decided within which the sensors operate normally. This has made the differential pressure sensor extremely versatile and as such these pressure sensors dominate in terms of application. Differential pressure sensors find their use in a wide variety of industries. Perhaps the most important use of differential pressure sensors however is to measure flow rates in pipes and locate leaks. This is done in accordance to the Bernoulli’s principle which states that the sum of potential energy, kinetic energy and force exerted by the pressure are constant. This means that when potential energy remains constant the increase or decrease in the rate of flow is inversely proportional to difference in pressure. This is coupled with a venturi tube having different cross sectional diameter at different points to accurately measure the rate of flow of fluid within the pipes. 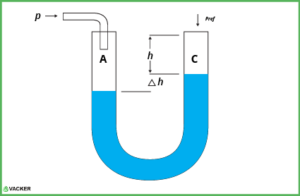 The pressure difference between the two sections of the pipe will, according to the Bernoulli’s principle, be directly proportional to the flow rate through the venturi tube. Using a differential pressure sensor the pressure difference between the two sections can be calculated. This same principle is useful in locating leaks in the piping systems too. Provided we know the flow rate of fluid through the pipe, we can estimate the change in pressure at two different points of the tube. If this difference exceeds the expected flow range, the sensor notifies the system that it is experiencing a leak. This is especially useful in monitoring gas and oil pipelines for potentially hazardous leaks. Differential pressure sensors are the preferred choice in measuring pressure. They are also the only type of sensor capable of providing changes in pressure as an analogous function as opposed to the digital responses of positive and negative pressure sensors. Piezo resistive strain gauges work based on the piezo-resistive effect. This is the name given phenomenon by which a metal or semiconductor experience a change in its resistivity when a mechanical strain is applied on it. Essentially, when pressure is applied to a piezo-resistive material its resistivity changes changing its resistance accordingly. This in turn creates a change in current which can be measured and from which the pressure applied can be calculated. Piezo resistive strain gauges are the most popular form of pressure sensors, applied for general purposes. It is ideally suited for positive pressure measurements and is a force collector type pressure sensor. A capacitor is made using a pressure cavity and a diaphragm. When pressure deforms the diaphragm, the capacitance of the capacitor decreases. The pressure applied can be calculated from the change in capacitance. This is also ideally suited for measuring positive pressure and is also a force collector type pressure sensor. Electromagnetic pressure sensors use a variety of inductance based effects including inductance, linear variable differential transformers, Hall Effect and eddy current to calculate change in pressure. Electromagnetic pressure sensors can be used to calculate both positive and negative pressures. Electromagnetic pressure sensors are a force collector type pressure sensor. 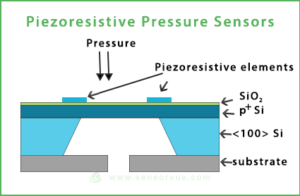 Piezoelectric pressure sensors use piezoelectric materials like quartz which on application of pressure produce electric current. Piezoelectric pressure sensors are particularly useful when trying to measure dynamic pressure loads which change with respect to time. In addition as they produce electric current in response to pressure they can be used to produce pressure waves which make pressure easy to monitor. 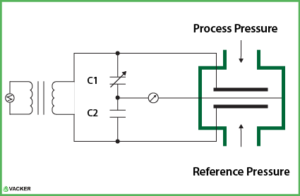 Piezoelectric sensors are often sensitive to variables other than pressure such as acceleration and hence top end piezoelectric sensors use correction factors to account for these errors. They are very versatile, usable in positive, negative and differential pressure sensors. 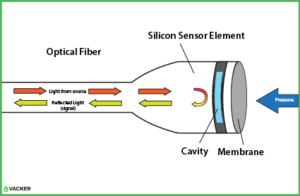 Optical pressure sensors calculate pressure from the strain caused on optical fibers due to applied pressure. This particularly useful in measuring remote pressure and measuring pressure under high temperature. But perhaps the biggest advantage of this technique is that it does not cause any electromagnetic interference. This makes it the ideal choice for measuring the pressure on sensitive electrical and electronic equipment. Optical pressure sensors are also a force collector type pressure sensor capable of sensing both positive and negative pressure. Here the optical fiber acts as the force collector. 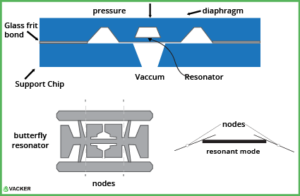 Resonant pressure sensors use changes in resonant frequency of a vibrating element due to applied pressure to calculate for applied pressure. Resonant pressure sensor are highly accurate and very stable. In addition, they can also be used to measure changes in gas density due to applied pressure. They are a non-force collector type pressure sensor and does not calculate strain or force. They can be used to measure positive or negative pressure directly and differential pressure indirectly. U tube manometer uses difference between the heights of two columns of fluid to measure pressure. The two ends of the U tube manometer (shaped like the alphabet U) are exposed to different pressure. Then the difference in heights of fluid column is calculated from which the pressure difference between the two media can be calculated. If the pressure applied on both arms of the manometer is the same, the heights of the columns of fluid will be the same and the pressure difference, zero. Manometers are ideally suited to measure differential and gauge pressure, both positive and negative. Mercury is usually preferred as the fluid to be used inside the manometer due to its high density. While accurate they are limited by their inability to calculate very high or very low pressure.